Located in the northern Caribbean region of Costa Rica, the Tortuguero National Park is home to one of the most docile, timid and elusive aquatic mammals. Trichechus manatus, also known asAntillean sea cows or manatees, once sought refuge exclusively in the canals of Tortuguero, but decades of protection have encouraged them to swim north to Barra del Colorado and even all the way south to Puerto Viejo and Sixaola, Jaime López reports in this article for The Costa Rica Star. According to a report filed by Andrea Solano of national newspaper La Nacion, studies performed by the Protected Maritime Areas Consolidation Program, sponsored by the United Nations Development Program (UNDP) and the Global Environmental Facility (GEF), indicate that manatees in Costa Rica are feeling more comfortable and venturing beyond their safe haven of Tortuguero. In the northern Caribbean, manatees have been sighted from Tortuguero to the canals Barra del Colorado Wildlife Refuge. From here, these gentle giants are swimming up to 20 kilometers into the sea. Tour guides and fishermen have seen manatees in various lagoons, including Agua Dulce, Garza, Pereira, and Yaki. In the southern Caribbean, these aquatic mammals have been sighted in the great lagoon of the Jairo Mora Gandoca Wildlife Refuge near Puerto Viejo. From this pristine habitat, they swim down to the Sixaola river. The preliminary reasons for this territorial expansion by the manatees in Costa Rica is that they no longer feel as threatened as they were prior to Tortuguero’s status as a wildlife sanctuary and national park. 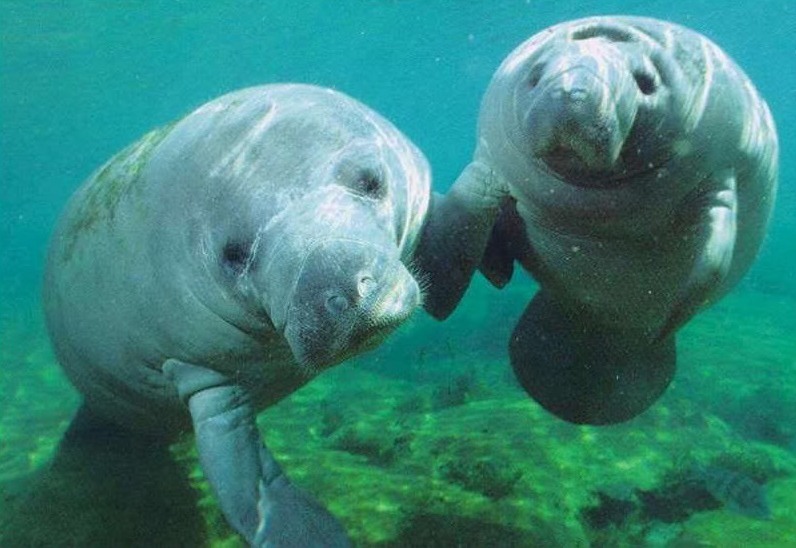 Conservation efforts have also resulted in a greater abundance of Urochloa mutica and Paspalum repens sea grasses, which manatees consume by the tons. Manatees in Costa Rica can grow to 3.5 meters in length and weigh up to 1,000 kilograms. They spend most of their time grazing on seaweeds that grow under brackish waters. They can easily consume more than 100 kilograms of sea grass per day, but they are slow to reproduce offspring.